I am a nanny and one of the children has celiac disease. The mother asked me to make a cake for her birthday that she could eat. The head of this cake is gluten free cake and all the frosting is gluten free but all parts under the collar on the poodle are regular cake. It is vanilla cake, dyed hot pink inside, with cream cheese frosting, and covered in fondant and pink cream cheese frosting! This homemade pink poodle cake was such a hit! 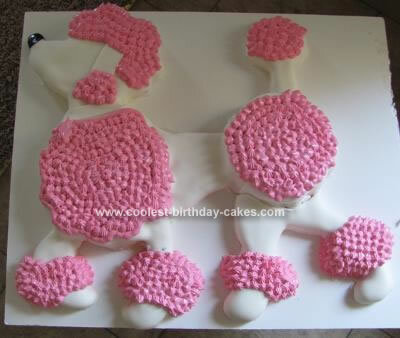 Birthday cake idea posted by Melissa N.
How did you make the poodle? This is such a cute cake I would love to make it but don’t think I could free hand this one!! How did you make this cake? Is is a rectanglular cake cut to form?